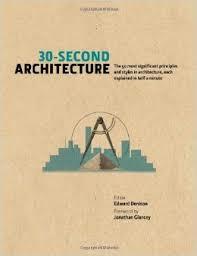 It really does take just about thirty seconds to read through each section summary of fifty key principles of architecture. Of course, you can spend longer in examining the illustrations or following further references. The success of the presentation lies in the effective level of condensing expertise without infantilising the reader. A useful reference guide even for those for some knowledge of architecture: for those wishing to learn, points are clearly made, examples are aptly chosen, and there are clear directions for further in-depth study. Profiles of significant architects and buildings add context and the guide works like a readable, illustrated glossary. Definitions of terms reveal such mysteries as the flying buttress – an arch which carries the thrust from a wall onto an external support, and an elevation, a drawing which depicts accurate dimensions of a façade. Insights into the way architects think include concepts such as the solid-void, the relationship between built and open space. This stylish book makes for enjoyable and educational browsing.